New Orleans has long been known as the oyster capital of America. For more than two centuries Gulf Oysters have inspired Creole and Cajun cooks to create a multitude of mouth-watering dishes – establishing oysters as a staple of New Orleans cuisine and culture. From Uptown to the French Quarter to suburban New Orleans to the Bywater, oyster bars are serving up grilled, fried, baked and raw oysters on the half shell. At Corporate Realty, we are proud to be a part of this rich heritage and commitment to celebrating history. It’s our pleasure to share our knowledge with you about real estate and food, two of our favorite topics. With this in mind, we hope that you will enjoy this year’s mailers. 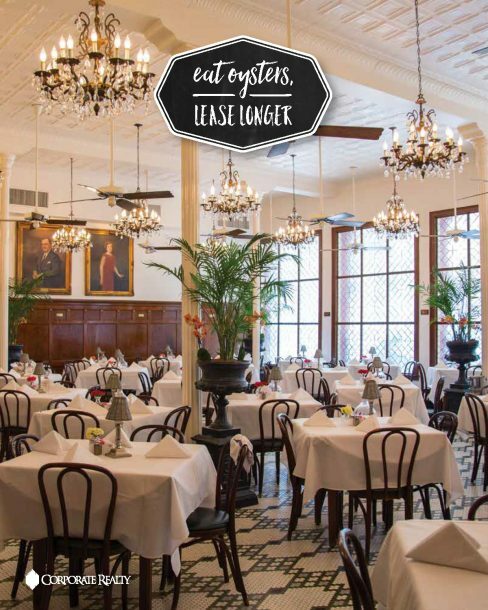 We will be posting an overview of our transactions and new assignments every month along with oyster recipes from legendary New Orleans restaurants. Our most recent mailer features Felix’s Buffalo Oysters.